Story by Shannon Wianecki. Photos by Bryan Derballa. Yo-yo players have invaded Iceland. Armed with spinning orbs, they’re everywhere across the Nordic Island nation: timing their tricks to geothermal eruptions at Ceysir, posing by hunks of blue ice adrift in the Jokulsarlon glacial lagoon and soaking in various sundlaugar (public swimming pools) in the heart of Reykjavik, Iceland’s charming capital. Two teenage yo-yoers stage an impromptu demonstration in front of Hallgrímskirkja, the Modernist church steeple that serves as Reykjavík’s compass needle. With a flick of their wrists, the boys unleash a dizzying stream of tricks: complicated cat’s cradles, improbable tosses and lightning-speed loops behind their backs. At times the yo-yos seem to float on a loose calligraphy of string. The audience winces when one yo-yo appears tangled beyond recovery—but no, its master holds up a palm and the disc snaps obediently home. Clearly these aren’t casual players. Nor are their yo-yos simple toys. The metallic discs wound with DayGlo string are—no joke—machined as precisely as space shuttle instruments. Onlookers can’t help but wonder: Has yo-yoing turned from kids’ game to extreme sport? This is the time and place to find out. The best of the best, the yo-yoing elite from around the globe have migrated to the Land of Fire and Ice for the 2017 World Yo-Yo Contest. Among them is a crowd favorite, a rising star from Hawai‘i. 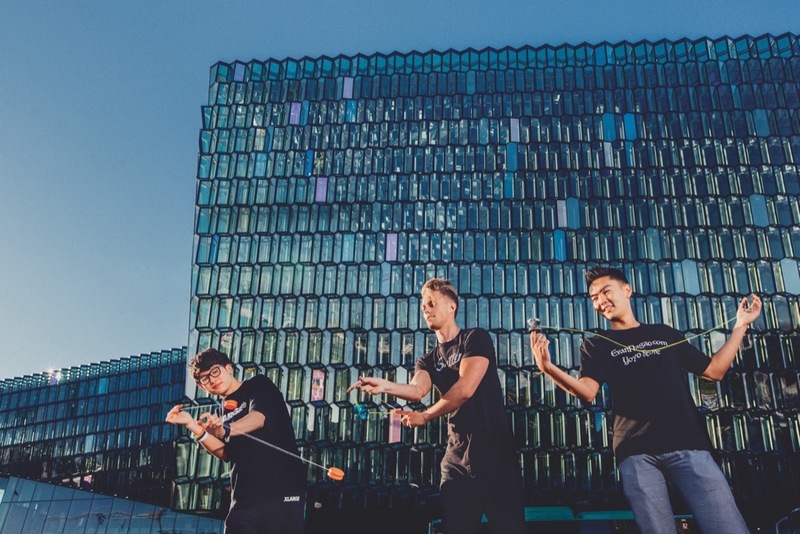 Hawai‘i’s own Evan Nagao performs yo-yo tricks outside of Reykjavík’s Harpa concert hall, where the 2017 World Yo-Yo Contest was held last August. His father Alan Nagao (behind Evan) is himself a heavyweight in the yo-yo world. Evan Nagao can’t help but practice tricks while waiting for his lunch. At a restaurant perched at the edge of Reynisfjara’s black-sand beach, the amiable 21-year-old from Honolulu pulls out a pair of yo-yos and starts slinging two-handed shoot-the-moons. Outside, orange-beaked puffins launch themselves from sea cliffs into the roiling Atlantic. The waiters stare at Evan. Instead of scolding him for endangering customers, they bring him a free ice cream. Pure injections of yo-yo glory—that’s what has brought Evan and the horde of throwers to Iceland. The idea of hosting the world contest here began as a joke between friends. After all, the sparsely populated country has just two pro players, Óskar Sigurhansson and Páll Gumundsson. 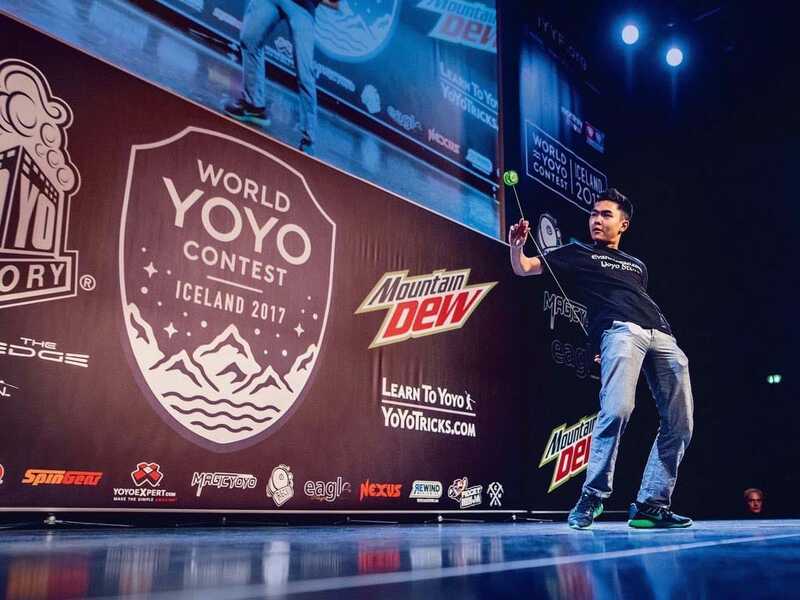 But their bid—a sumptuous video montage of yo-yo tricks performed at the edge of waterfalls and glaciers—caught the International Yo-Yo Federation’s attention. When team Iceland snagged the world-class Harpa concert hall as a venue, the deal was sealed. The yo-yo ranks among humankind’s oldest toys, alongside dolls, sticks and balls. Chinese children likely played with yo-yos some three thousand years ago before the toy spread to India, Egypt and beyond. Reykjavík is an accommodating destination; its walkable streets are lined with a crayon box of painted corrugated steel houses that Icelanders rent out to the growing throng of visitors. During August the sun barely sets. Snow is missing from the fjords across Faxa Bay, but lopapeysa (Icelandic wool sweaters) are still necessary to fend off gusts that dip into the forties. At the north edge of the city, Harpa glitters like a multifaceted jewel. Its honeycomb windows reflect the sea and sky, with tinted panes that recall the northern lights. Home to Iceland’s opera and symphony, it’s a sophisticated setting for a bunch of teens tossing toys. On the contest’s opening day, adolescents in skinny jeans and sneakers flood Harpa’s voluminous lobby. They ditch their backpacks with parents, greet long-distance friends and immediately start twirling their favorite stress relievers between their fingers. Tourists stop to gawk, while their children eyeball the fluorescent yo-yos, stickers, holsters and other paraphernalia piled high on vendors’ tables. A man wearing a “Yo-Yo Instructor” t-shirt catches a young girl’s eye and nonchalantly skips a bright red yo-yo along the floor toward her—the classic “Walk the Dog” trick. “Here,” he says, handing her the toy. “You try.” And that’s how it starts. She might get hooked and later recall this day as the beginning of a lifelong passion. Evan Nagao at Skógafoss, one of Iceland’s largest waterfalls. “Kids can be shy, but when it comes to the yo-yo, they break out of their bubbles to share tricks,” says the instructor, Hans “Yo-hans” Van Dan Elzen. He found his first yo-yo in a friend’s drawer in 1987. Back then, before the internet, the only way to learn tricks was to find someone willing to teach you. Yo-hans learned to “Split the Atom” step by excruciating step over the phone and later got a job demonstrating it for Playmaxx, a large yo-yo manufacturer. By age 26 he’d been to twenty-six countries spreading the yo-yo gospel in schools, parks and shopping malls. Yo-yoing is the ultimate accessible sport: It doesn’t require any particular physique. The equipment is inexpensive and pocket-sized. Anybody can pick up a yo-yo and, with a Herculean amount of practice, become a champion player. That said, the pros gathered here in Reykjavík fit a rather narrow profile: between 10 and 26 years old and predominantly male. Of the two hundred registered competitors, only twelve are female. The largest contingents have come from the United States, Japan and the Czech Republic; smaller groups are here representing Mexico, Indonesia, Israel and South Africa. In return for this near-fanatic devotion, the humble yo-yo offers the possibility of world travel and minor celebrity. Nail a tough trick on YouTube, and your video stands a good chance of going viral. While top yo-yoers don’t win monetary prizes, they do have some financial incentives. Manufacturers sponsor star players and invite them to design signature yo-yos; they receive commissions from each sale. Yo-hans managed to turn his yo-yo habit into a career. After several years repping for Playmaxx, he started his own company, YoYoFactory, which sponsors hotshots like Shu Takada of Japan and Evan Nagao of Hawai‘i. Shion Araya of Japan defended his first-place title to win a second consecutive contest. Both Araya and Nagao compete in the 1A Division, distinguished by tight, artistic yo-yo routines at hyper-speed. Alan is a charismatic entrepreneur who overcame a rough start. Exposed to the drug thalidomide in utero, he was born missing a leg and some fingers. By necessity or choice, he became the kind of person who sees obstacles as opportunities.“Being disabled, I didn’t have a lot of sports I could do in school,” Alan says. “So I enjoyed kite flying and yo-yos and things that didn’t require running.” In 1982 he opened High Performance Kites in Honolulu and began flying competitively. Alan noticed a spike in yo-yo sales in the early ’90s and stocked more spinning toys. He hosted yo-yo demonstrators from the Mainland and developed the “trick ladder,” a testing system to encourage beginning players to progress. “My objective was to give kids an alternative to the violent video games that were so popular,” says Alan. As kids mastered tricks, he watched to see whether they had potential to go professional. He put together the first all-star yo-yo team. As Team High Performance, young yo-yoers from Hawai‘i traveled around the globe competing in contests and teaching tricks. “They were superstars, the most famous yo-yo kids in the world,” says Alan. “They had trading cards and uniforms with their names embroidered on them. They even became cartoon characters in Japan.” Alan helped coordinate a massive yo-yo pro-motion at the Tokyo Toy Fair in 1998. Seventy thousand kids (you read that right) came to watch Team High Performance ricochet, dodge, feint, twirl and dance with tiny spinning rounds tied to their fingers. THP’s pro spinners were just kids themselves, age 10 to 16, but they influenced a generation. More yo-yos were sold that year than any other in history: ten million in Japan and another twenty million in the United States. The following year, Hawai‘i hosted the World Yo-Yo Contest. This should have been a celebratory culmination of Alan’s efforts, but his yo-yo empire had grown too big too fast. By 2003, Team High Performance disbanded. “We’re very, very focused on playing with yo-yos,” says Nagao. “We joke that it’s mild autism. The community is tight, and we’re all a little bit strange.” Left to Right: Gentry Stein, the 2014 world champ; Nagao; Chloe Monsonego of France. Evan kept a yo-yo in his pocket through-out his school years, periodically entering contests. He made his first bid as a serious competitor three years ago and has consistently placed in the top ten ever since. When YoYoFactory asked him to develop a custom yo-yo, he named it “The Edge.” By coincidence, that’s what his father called his signature kite back in his pro flyer days. 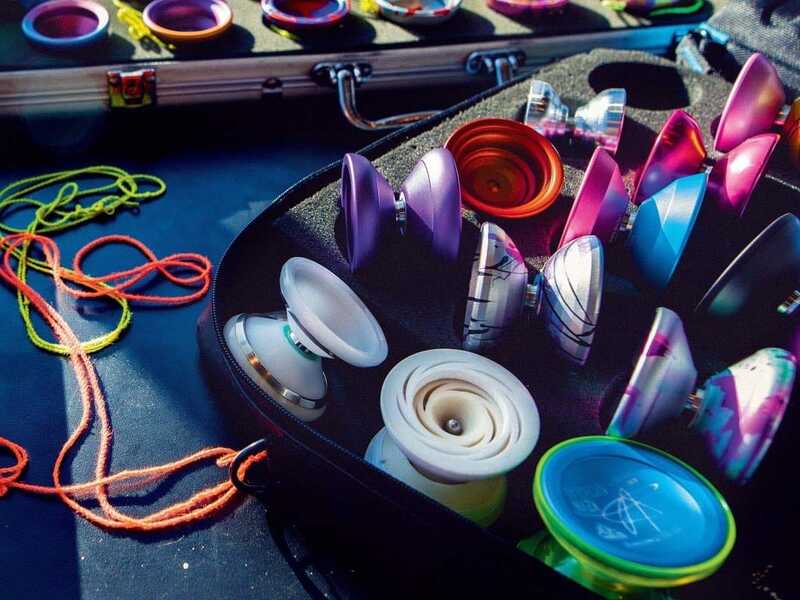 The worldwide yo-yo community might be niche, but what it lacks in size it makes up for in verve. Fans display their enthusiasm during the finals, in which Evan placed sixth overall. Former champion Gentry Stein of California performs his routine during the semifinals. After months—maybe years—of practice, it’s showtime at the 2017 World Yo-Yo Contest. First up is the wild card division, which anyone can enter. Eleven-year-old Oliver Neuschuez walks on stage, a yo-yo coiled in his palm. “Player ready?” the female emcee asks. Oliver nods. The rapid-fire music starts and Oliver’s yo-yo springs to life: a whirring, spinning planet orbiting his nimble fingers. As a wild card competitor, he has just thirty seconds to convince the judges to advance him to the next level. For this half-minute of fame, his family traveled 2,386 miles from Strafford, New Hampshire, to Reykjavík. His impatient sister sits in the audience, eager to get back to sightseeing and collecting puffin souvenirs. Whether Oliver qualifies for the next round is almost irrelevant. Sure, it would be a gigantic thrill, but for a lot of contestants, this weekend is more about communing with friends who share their obscure obsession—and rubbing elbows with their favorite YouTube celebrities. Shu Takada, reigning champ of the 2A Division that incorporates twin yo-yos in two-handed looping tricks—reminiscent of traditional Māori poi balls. Judges click counters each time the yo-yo touches the string—a subtlety that requires laser vision to see. Just how fast do yo-yos move? Dale once measured his spinning speed: in excess of 14,300 rpm—almost 100 miles per hour. In 2004, Yo-hans set the Guinness World Record of tricks per minute: fifty-one. That’s likely been surpassed, if not officially. Each time a player executes an especially tough trick, the audience hoots in unison. Mistakes are a given; perfection at this level of complexity is impossible. But the best players recover so quickly that casual observers don’t notice. If NASA needs pilots with split-second reaction capacities, they’d do well to recruit here. Of the six competitive divisions, 1A is the most hotly contested, with the largest number of contenders. Competitors execute tight, artistic yo-yo routines at hyper-speed. “Making knots and getting out of them,” as Jake calls it. Division 2A incorporates twin yo-yos in two-handed looping tricks—reminiscent of traditional Māori poi balls. Other divisions feature spin-tops and off-string yo-yos, where players toss unencumbered discs into the air and lasso them with string. This is Dale’s twenty-sixth world championship, and he’s still got game. He performs to The Beatles’ tune “When I’m Sixty-Four,” and the audience goes nuts. “The camaraderie amongst yo-yoers is really incredible,” he says afterward. “I haven’t seen that in any other competitive sport.” While yo-yoers might seem peculiar to outsiders, their tightknit, supportive club comes with lifetime membership. The air is electric on the final day of the 2017 World Yo-Yo Contest. Vendors have vacated the auditorium to make room for fans. Kids who were rehearsing in hallways are now wired to their seats. The Icelandic hosts, Óskar and Páll, are ecstatic that they’ve pulled off a successful event. a little too competitive to be called a hobby. Some people like to call it a spobby.” Here, Nagao performs his spobby beside Iceland’s iconic Gullfoss waterfall. Wild cheers greet Shu Takada, the reigning 2A champion. Bespectacled and sincere, he looks like a Japanese Harry Potter; his pale face betrays no sign of his near-superhuman powers. When his soundtrack starts, he catapults into a backflip, landing with two bright orange discs in action. He whips them around his neck, in tandem and at different speeds and directions. Leaning into a deep backbend, with his yo-yos abuzz above him, he looks as if he’s boxing with bumblebees. Shion Araya, last year’s 1A winner, takes the stage to the smooth R&B beats of “Take No Defeat,” an auspiciously named tune by banvox. He performs a near-flawless routine that increases in speed and intensity to its finale, when he thrusts up his arm to signal number one. Evan’s routine starts with three dramatic yo-yo punches, perfectly timed to the opening beats of “Look at Me Now,” by Chris Brown. He then launches into a blitz of tricks synced to superfast rapping by Busta Rhymes. The audience roars as he bangs out one astonishing move after the next, pausing between beats to grin conspiratorially at his fans. Then, in the middle of his most daring sequence—a series of ninja-like loops under both legs and behind his back—Evan misses a catch. His yo-yo hits the floor. The audience falls silent. Evan just flashes another big grin and keeps going. In the end Shu captures first place in the 2A division, and Shion wins the 1A. A wild card contestant, Conner Seals, progresses all the way to the finals to finish eighteenth—a remarkable achievement. Evan places sixth. If he is disappointed, he shows no sign. Like his father, he takes setbacks in stride. Two months from now, at the 2017 US Nationals, he will take another crack at that extra-slippery sequence. This time he will nail it to become the US champion.